The number of signed purchase agreements in the 13-county Twin Cities region reached a 10-year high for the month of April. The figure came up just shy of reaching a 10-year record high for any month. Buyers wrote 6,329 offers to purchase homes, a 26.0 percent increase from last April and the most for any month since June 2005. New listings also rose as sellers continued to regain confidence. 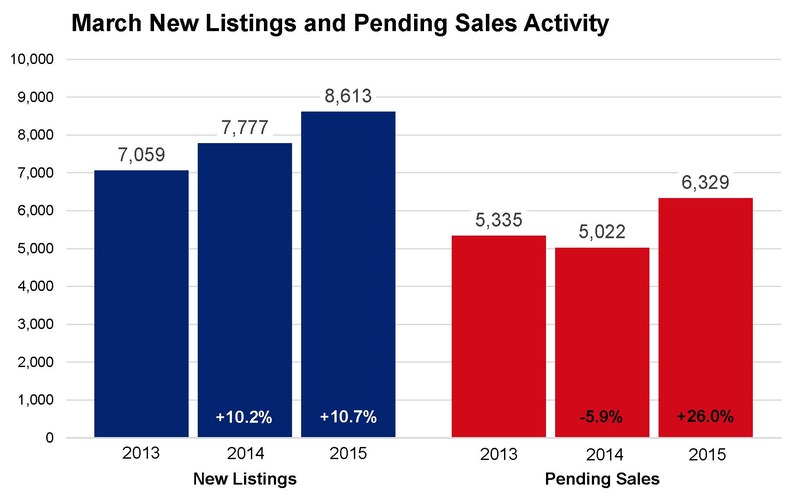 The number of new listings increased 10.7 percent to 8,613 during the month. That’s the highest number of new listings for any month since the home buyer tax credit period of April 2010. The median sales price sustained its upward trajectory, increasing 10.0 percent to $215,600. The median home price has now seen 38 months of year-over-year increases. Price per square foot—which accounts for the rising square footage of homes selling—rose a more modest 3.0 percent to $124. Months supply of inventory fell 5.6 percent to 3.4 months, and still points to an overall seller’s market. Days on market decreased for the first time this year. Those selling their homes are waiting an average of 85 days before accepting an offer. As a result of the strong demand, inventory shortages in the most popular price ranges and neighborhoods can still be challenging for many buyers. Over the last 12 months, inventory levels fell 1.1 percent in the $100,000 to $249,999 range but rose 22.2 percent in the $250,000 to $499,000 range. The number of active listings for homes priced above $500,000 rose 21.4 percent. Among the different property types, inventory levels fell 4.6 percent for condos and 0.9 percent for townhomes, but rose 10.0 percent for single-family properties. The number of homes on the market rose 6.2 percent over the past 12 months for previously owned homes, but the figure increased 19.3 percent for new construction homes. The finance environment remains favorable. Mortgage rates are approximately 3.9 percent, compared with a long-term average of 7.0 percent. The Twin Cities housing affordability index actually increased since this time last year. A diverse and growing regional economy has served the Twin Cities housing market well throughout the years. According to the Bureau of Labor Statistics, the Twin Cities has the fifth lowest unemployment rates of any major metropolitan area in the nation at 4.0 percent. Forbes ranked Minnesota as one of the top 10 best states for business, seventh in economic climate and second in quality of life. “The numbers combined with the sense of urgency really paint a clear picture,” said Judy Shields, MAAR President-Elect. “Buyers are quite motivated, hoping to get in before rates rise, though both buyers and sellers stand to benefit from the current market environment.” From The Skinny Blog.